Will you have some buns? 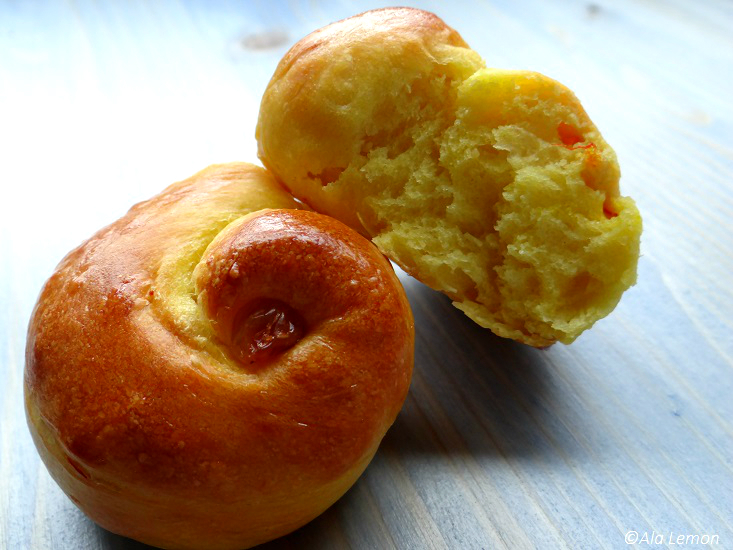 Saffron buns, I mean. In Sweden, and other Scandinavian countries, saffron rolls are baked only during the Christmas holidays, starting with St. Lucia’s Day on December 13th, also known as the Festival of Light. According to tradition, young girls are dressed in white gowns with a red sash (symbolising the martyrdom of St Lucy of Syracuse), with one girl selected as “Lucia” leading the procession. She wears a crown of (now electrical) lit candles, while the others carry a single candle. In families, Lucia is usually the oldest daughter. She awakens the family, serving her parents breakfast in bed, comprising of coffee and saffron buns, thus officially launching the Christmas season. For a hilarious explanation of the celebration of St Lucia in Sweden, just watch this video. 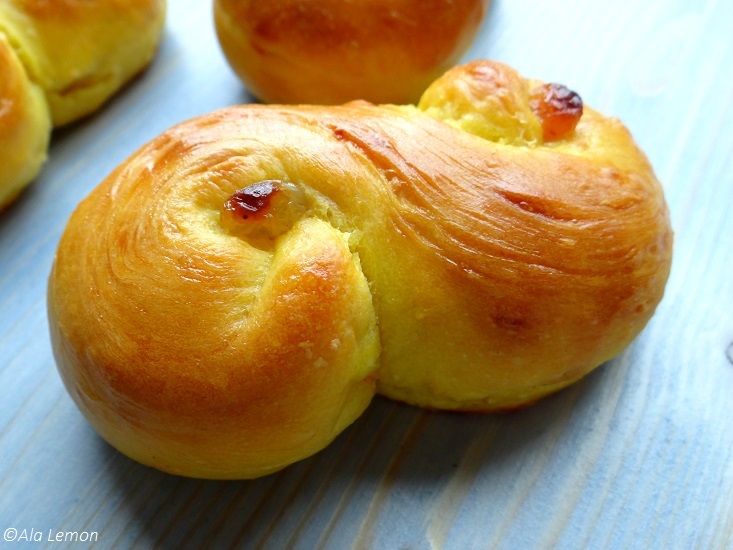 However, some claim that the invention of saffron buns, or Lussekatt, predates the celebration of St Lucia’s Day. It usually involves the devil or a demon, sometimes dressed up as a cat (Katt, in Swedish), beating or kidnapping children. Adding saffron to the buns was said to brighten them up and their light would scare the devil/demon away. While doing my research, I found that most Swedes, such as Marcus Samuelsson or Anna from That Oven Feelin’, do not use eggs in their dough, only to brush over. Consequently, the buns can be quite dry, so more milk or butter is added. But you can also use sour cream, which I did, or Greek yogurt (real one, if you can find some – but please, I beg you, do not use the « Greek-style » thing you find in supermarkets that has absolutely nothing to do with the real deal). Or, if you’re lucky enough to find some, Quark cheese. Combine the milk and saffron threads, and heat in a pan or in the microwave until warm but not hot. Let cool for 10 minutes. Melt the butter in the microwave or in a separate pan, and allow to cool before stirring it into the milk. Sift the flour into a bowl. Add the sugar, baking powder and salt, and mix with a wooden spoon. Stir in the milk and sour cream. Bring together to form a dough. Lightly flour your working surface, tip the dough and knead until smooth and elastic, about 5 minutes. Put the dough back in the bowl, cover with Clingfilm and leave to rise in a warm spot for 1½ hours or until it has doubled in size. Grease two baking trays, or line them with baking paper. Tip the dough onto a lightly floured surface and knock it back in one or two punches. Divide into 12 equal pieces (mine were about 80g/2,8 oz. each). Roll out each piece into a 25 cm/10 in. cylinder and roll each end in so as to form an S shape. 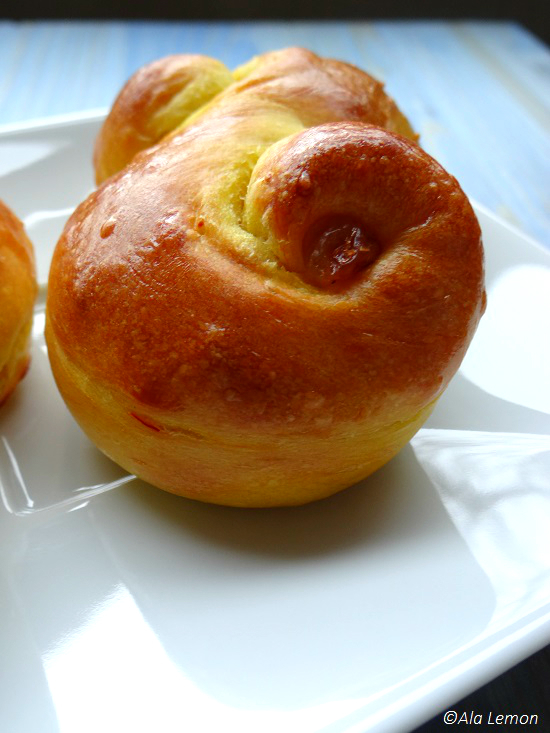 Place on the baking sheets and add a raisin into the centre of each of the two “eyes” of the rolls. Cover with a towel and let rise for 45 minutes, or until the buns have doubled in size again. Beat the egg and brush over the buns. Cool on a wire rack before serve warm with cold milk, hot chocolate… or a cup of glögg (mulled wine). Oh my gosh, that video is hilarious. Since Lucia is only a few days away, I’m gearing up to make lussekatter myself (and the required glögg of course)!